Blue Buffalo Blue Wilderness Trail Treats Turkey Biscuits Dog Treats, 24 oz. 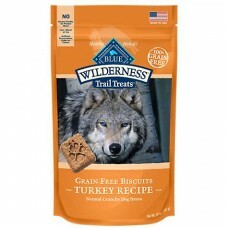 Blue Wilderness Trail Treat Biscuits are so tasty that the entire wolf pack would run for miles to get just one. A 100% Grain-Free Baked Treat Like all Blue Wilderness foods, Wilderness Trail Treat Biscuits are 100% grain-free so your dog can enjoy a high-protein treat without any of the grains that contain gluten.